MODERN 3D PRINTING TECHNOLOGY HAS RADICALLY CHANGED THE WAY WE MAKE CASTINGS FOR ANTIQUE AUTOMOBILES. IT IS NOW POSSIBLE TO ORDER A REPRODUCTION ENGINE BLOCK AND RECEIVE A FLAWLESS CASTING, AT A FIXED PRICE ON A FIXED SCHEDULE. CASTING POROSITY & CORE SHIFT HAVE LARGELY BEEN ELIMINATED. THE FIRST CASTING POURED IS OFTEN A GOOD CASTING. TRIAL & ERROR FOUNDRY WORK IS MOSTLY A THING OF THE PAST, DUE TO MODERN SOLIDIFICATION SOFTWARE. LEE STOHR HAS BEEN PRIVILEGED TO WORK ON THE REVERSE ENGINEERING OF CASTINGS OF HISTORICAL SIGNIFICANCE, INCLUDING A WRIGHT BROTHERS ENGINE AND INDY 500 RACE CARS BUILT BY HARRY MILLER. BELOW ARE EXAMPLES OF CASTINGS AND CAD WORK BY STOHR DESIGN. CONTACT STOHR DESIGN FOR MORE INFORMATION - 540-255-6772. WITH THE STOHR DESIGN CAD MODEL SHOWN BELOW. 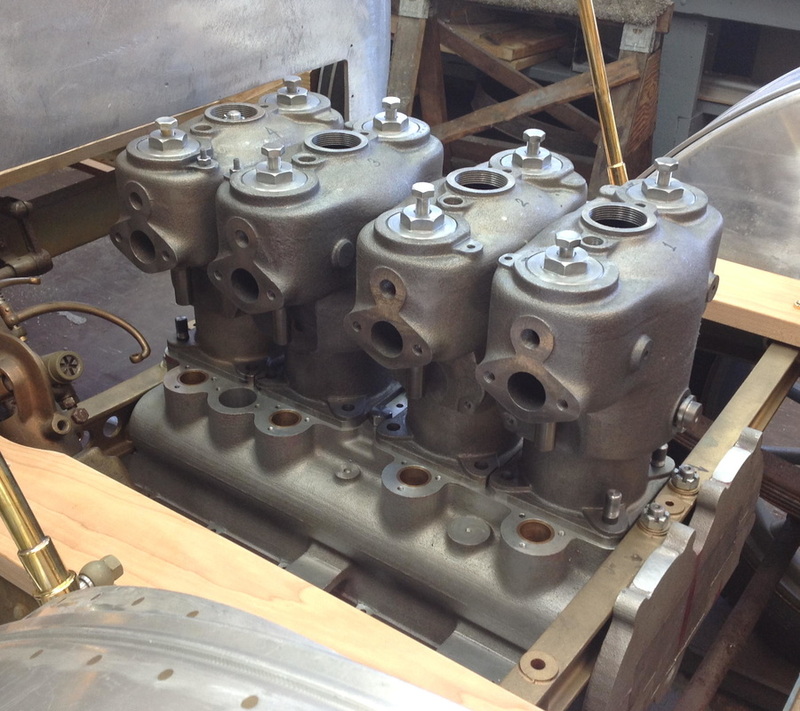 RECREATING A 1907 AUTOMOBILE ENGINE - CRANKCASE, CYLINDERS, MOUNTING BARS, OIL PAN & FRONT GEAR COVER by STOHR DESIGN. INVESTMENT CASTING WAS USED TO CAPTURE THE FINE DETAILS ON THESE BRACKETS.